"French and Continental Spanish both have academies, founded in the seventeenth and eighteenth centuries, respectively, and it is true that they issue edicts on which constructions and words are 'allowed,' and they have lexicographical arms that issue dictio­naries with the 'correct' words in them. Be that as it may, that doesn't stop the French and Spanish from using whatever words they damned well want. "The call for an academy of English fizzled, though there are still stragglers to the game, either crying out for its creation or volun­teering to be that academy. In its absence, though, people who yearn for definitive guidance have created something similar: The Ameri­can Heritage Dictionary's Usage Panel. 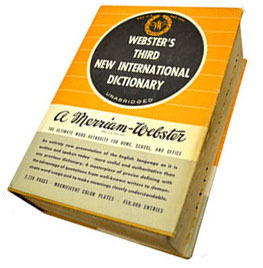 "When Webster's Third was released in 1961, it represented a marked departure from previous Merriam-Webster dictionaries in many ways, but the thing that gained the most notoriety was a new Websterian adherence to describing as much of the language in use as possible, including contested uses (like the extended sense of 'decimate'). There was a swift backlash from the literati of the day who deplored what they perceived as laxity in Webster's defense of the language. There was extensive bewailing of the death of English, sped along by the ... 'passel of double-domes at the G. & C. Merriam Company joint,' as one New York Times editorial put it, and along with the pearl clutching came several high-profile requests to pulp the entire run of the Third and go back to the good old days of Webster's Second, which didn't shy away from using labels like 'illiterate' and 'uneducated.' But Merriam sailed onward, heedless of the calls for reform (no doubt because the idea of junking the Third, a dictionary that took more than a hundred editors twenty­-seven years to complete, sent the then president of the company into apoplexy). The Third was one of its flagship products, and the G. & C. Merriam Company would abandon it when hell froze over. "One James Parton, the publisher of American Heritage maga­zine, decided to do all he could to make it snow. In 1962, a few months after the release of the Third, he began buying up shares of Merriam stock with the view of buying out the company. His reason: the company 'badly needs new guidance,' and the Third was 'an affront." His plans were to 'take the Third out of print! We go back to the Second and speed ahead on the Fourth.' When the hostile takeover failed, he did the next best thing: he created his own dictionary to right Webster's wrongs and give America the authority it clamored for. "Nonetheless, the panel has historically trended toward being lin­guistically conservative, particularly in eschewing both new mean­ings of old words and functional shift (that is, a word's moving from one function to another, like the verbing of nouns). If there was ever a haven for fallacists, the panel was it. And while they hold to bits of etymological fallacy -- in the early years of the twenty-first century, 58 percent of the panel reported that in their own writing they restricted the use of 'dilemma' to refer to one of two options rather than using it as a general synonym of a problem, because its root 'di-' means 'two' -- enough of the panel finds the positive 'awfully' and the great 'fantastic' so unremarkable that usage dis­cussions for these two words don't even appear in the latest edition of The American Heritage Dictionary. "People who supposedly care about correct English love the Usage Panel, but for reasons that are all smoke and mirrors. The panel didn't have, and still doesn't have, authority to decide which words are actually entered into the AHD. 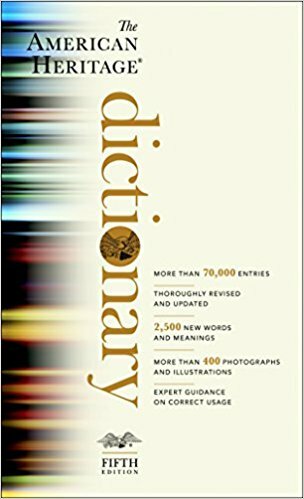 Steve Kleinedler says, 'I think everyone on the Panel recognizes the role of a dictionary. No one has ever said, "Ain't shouldn't be in," or "Irregardless shouldn't be in."' Good thing, too, because 'irregardless' and 'ain't' both appeared in the first, most conservative edition of the book, and they continue in it today, stubborn barnacles of nonstandard English that can't be completely scraped off the hull of the language. (Interest­ingly enough, only 90 percent of the panel disapprove of 'irregard­less,' which makes me wonder: Who are the turd stirrers infiltrating the panel?) Today, the panel comprises 205 people; they are, as a whole, much less linguistically conservative than their forebearers. Eighty-one percent of them, as of the 2005 balloting, have no prob­lem with the extended sense of 'decimate' that refers to widespread death, not just death restricted to one-tenth of a group, and 36 per­cent of them are fine with the sense of 'decimate' that refers to extensive damage (as in 'The crops were decimated by drought')."